Is there anything nicer than getting a package full of surprises in the mail? How about a package full of surprises in the mail once a month! I’ve noticed a growing number of monthly subscription-box services popping up lately; I decided to check out a bunch of them and report my findings here. Previously reviewed: Knoshbox and La Bella Box, two great gift ideas for adults; and for kids, there’s Wonder Box, BabbaBox, Kiwi Crate, Little Passports, and Green Kid Crafts. Today we’ll take a look at geeky, artsy, and crafty subscriptions for grownups. 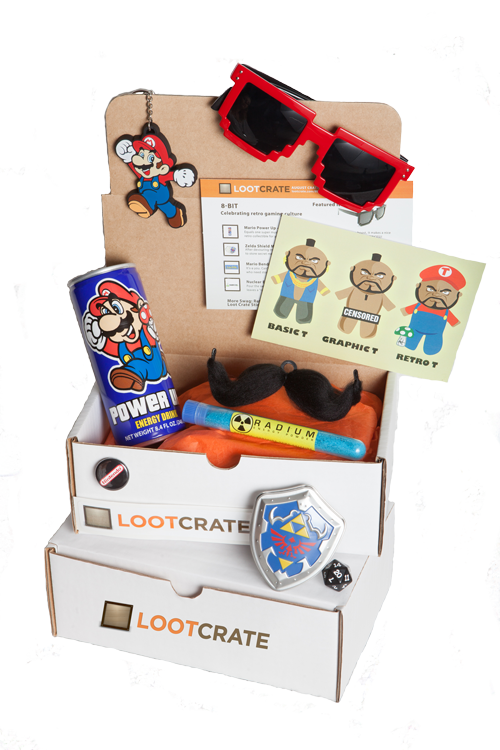 LootCrate, pictured above, is a treasure box for geeks and gamers. This is a subscription service unlike all the others — the emphasis is on humorous, offbeat items with strong geek appeal. I know a lot of teens and college students who would enjoy a subscription to this Comic-Con-swag-flavored collection of oddments. The community of LootCrate subscribers has a lively presence on Facebook and Twitter, and you’ll find a slew of enthusiastic “unboxing” videos on YouTube after each new shipping date. Sample contents: Each month’s box has a different theme; the one I sampled was “8-Bit — A celebration of retro gaming culture,” featuring 80’s Nintendo and Sega-themed gear. This included a Mario Power-Up energy drink; a tin of Zelda Shield mints that my teen girls fought over; a rather fabulous bendable Mario mustache that inspired a last-minute Halloween costume change for one of my daughters; a tube of blue raspberry-flavored “Nuclear Energy Powder” I haven’t been foolhardy enough to try; some retro gaming buttons; a whimsical Mr. T art piece; a d20 (naturally); a LootCrate sticker; and a pair of 8-bit sunglasses. Sample Umba Box contents. Image source: umbabox.com. Umba Box is for the Etsy lover: a monthly subscription bringing you two or three handmade, lovely, thoughtfully curated items such as jewelry, stationery, accessories, and bath products. The fun here is in the element of surprise: you never know quite what to expect, but you know it will be beautifully made. Because Umba Box aims to introduce its subscribers to artisans, each shipment includes bios of that month’s makers. The Umba blog and Pinterest page are also wonderful vehicles for Etsy discovery, and if you search Instagram for #umbabox you’ll find loads of unboxing photos each time a new box lands. An Umba Box subscription would make a great gift for your mom, your sister, your best friend. Sample contents: The October box featured a reusable handmade sandwich bag by Radish Co. and a pendant by Whiskey and Wine. I’ll be honest; neither of these were exactly my cup of tea, but I have friends who would appreciate them, and it’s always good to have a nice hostess gift or thank-you present on hand. But the November items are mine mine all mine. Fleur de Sel Caramels from The Caramel Jar; a small, cloth-covered, hardbound journal from To Boldly Fold (swoon); and a set of decorated, magnetic Fancy Clothespins from Earth Cookie Creations. Monthly subscription cost: $25. For the holidays, there’s also a more expensive edition containing a larger assortment of items. For the Makers delivers a box full of high-end craft projects to your door every month. All the materials you need for each of the four projects are included. There’s a walk-through for each craft on the website. This is a good way to indulge your desire to do a bit of embroidery, sewing, or jewelrymaking without having to wander the aisles of the craft store hunting supplies. The scope of the projects is small enough to be manageable in a few sittings, but they’re quite lovely — not at all kitschy or throwaway. 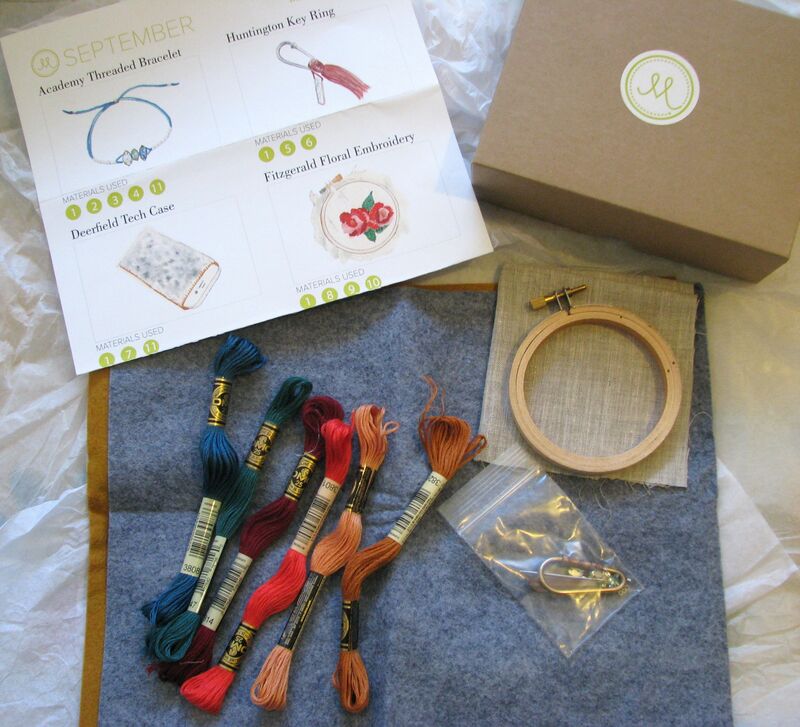 Sample contents: The September box’s projects were a very pretty threaded bracelet, a tassled key ring, a jewel-toned floral embroidery, and a felt case for your phone or iPod. All the little odds and ends were included. My 14-year-old daughter commandeered this box, and I’m fully expecting that lovely bracelet for Christmas. The October box had a black-and-white theme; the crafts were a hematite fishtail bracelet (very cool), an embellished hair comb, a wood-block stamping project for gift bags and note cards, and a pair of earrings. Samples provided for review. Next up: subscription boxes for healthy living.